We AreWings Lifestyles WINGS LIFESTYLES manufacturers & retailers, Women's Clothing. 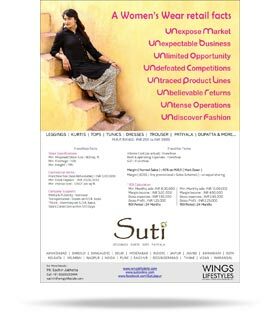 "Suti" is the brand in India for woman's wear with its own in-house massive manufacturing unit. Since past 15 years we have maintained a dedicated team who carefully observe every minute detail in the manufacturing of best quality products. From designing, dyeing, printing, embroidery, stitching, finishing, washing, packaging, dispatching, marketing, sales; we do it all with grace, honesty and grit. It is our prerogative to make you one with your inner beauty and to do that we ensure core quality and for that we do not outsource, so as to see everything happening in close supervision. The source of fabric is exclusive to us and makes it for our exact specification. "SUTI" doesn't mean just cotton but also deals in other fabrics like woolen, Georgette, chiffon, Dobby, Jacquard etc. From Formal, Casual, Club and Party wear we create complete solutions for woman's clothing, for her every mood. Our western and ethnic garments have the grace to make a woman look ageless and timeless. Our retailers, M B O's and E B O's can be rest assured of an undoubted repeat demand leading to a high margin/profit further facilitating an overwhelming Return On Investment. SUTI ensures that such will be the level of your confidence in us that earning massive margin chunks would be cake walk . SUTI will always be like an eternal diamond for you which can be encashed any time any day keeping you secure in a cosy blanket and like that shooting star which as soon as you see, shall make all your dreams come true. Centralized branding and advertizing policies. As a franchise you represent "SUTI" in your area to the local society hence it becomes your implacable duty to maintain dignity and respect in its original stature and take it to newer heights.